A couple more impressive posters to feature today. Most probably already know I'm a big fan of both Tron Legacy and Let Me In. so obviously if there's an awesome poster for either movie, I'm going to mention it. IMPAwards just dug up two sleek bew posters for both, but since they're international (Tron is from Japan, Let Me In is from France) I decided to toss both of them together into one big post. I love the Let Me In one because they can promote it without having to worry about the MPAA and that includes putting a little blood on there. As for Tron, it's just a cool design (a lot better than this one) but it's not particularly my favorite. You can click on either poster below to see full-size. Don't be fooled by the Tron poster, I'm pretty sure Sam Flynn and Quorra (played by Olivia Wilde) are not actually enemies in the movie, they're on the same side! Let Me In is both written and directed by American filmmaker Matt Reeves, who's feature directorial debut was J.J. Abrams' Cloverfield but prior to that he directed episodes of "Felicity" and various other TV shows. This is a re-adaptation/remake of the Swedish novel and feature film Let the Right One In written by John Ajvide Lindqvist. Overture Films is bringing Let Me In to theaters everywhere starting October 1st this fall. 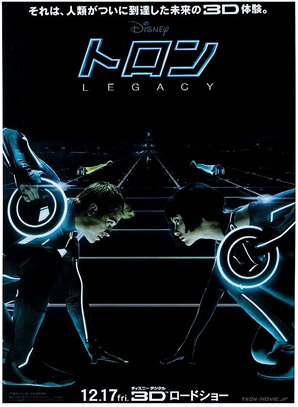 I dunno, the 'Tron Legacy' Japanese poster is slightly underwhelming. 'Let Me In', however, looks pretty awesome. I'm totally waiting for both these films! I fail to see what is 'beautiful' about either of these posters. Each to their own I guess. Let Me In is hawt. Tron is yawn. blood down left side of lips where have I seen that before. Why do vampires always seem to dribble? #1 and #2 agreed!! My fingers are crossed too. Let Me In Poster looks cool, Tron Poster looks average. I've seen better Tron Posters, The Let me in poster seems too fake.